Passing the puck properly requires creating momentum behind the puck, having vision for where you want to place it and sending it with a sense of purpose. These do’s and don’ts will definitely get you moving the biscuit with some authority for sure! Bend your kness– a good skater never sees his toes, same goes for a great passer. 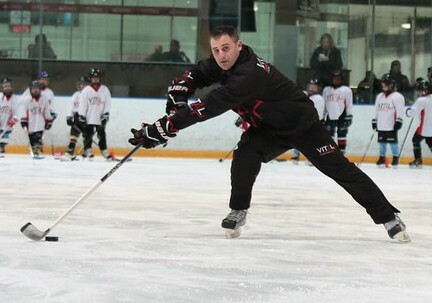 The optimum knee bend to assure consistent pressure on the puck through the whole knee bend is vital. What does optimum knee bend look like? Bending the knees until your knee just covers the toe caps of your skates. Of course it is not advisable that you look down to see if you are doing this every time you have to pass the Keep reminding yourself in practice until your body begins to recognize the feeling of proper knee bend (a.k.a. muscle memory). Plus, you will know if you in the best knee bend by the way your stick flexes. It will have that kick point! Pass ahead of your target- One of the most seemingly common sense things about passing that always seems to fly under the radar, even at the pro level. Most passing mistakes are the result of incorrect gauging of speed and potential direction of the player they want to pass to. Come to think of it, can you think of a more complex skill to execute in the game: keeping your feet moving while using your body language to disguise your true intentions, all the while handling the puck without looking down so that you can key in on your players velocity and predict the path of his next 3 strides? Follow through to your target– Most players start with the intention of passing, but finish with no more than a glorified putt! The part that dictates the effectiveness of the pass is the follow through. My general rule is that if I can say “one onethousand” from the time the puck leaves a players stick, to the time it arrives on the tape of their teammate, the pass is too soft. Every moment the puck is in transit, is an available opportunity for interception. Nothing beats a team that challenges each other in practice with crisp passes. Disguise your true intentions- yes Sun Tzu would be extremely proud you master of disguise you! Telegraphing your pass is the unfortunate result of lack of skill (puck carrying skills have not yet become automated in the subconscious) and vision (ability to extend a teammates trajectory and predict where they are going to be). Players who telegraph passes with over exaggerated windups toward the target while gliding momentarily are really demonstrating their decision making process, which has not been automated yet and is manifesting physically through body language. Take time to pull the puck back– A pass without a windup is closer to a golf putt, than anything related to a hockey skill. There is no way a pass coming from the same side of your body as the intended target can get there in any respectable amount of time or intensity. Moreover, it is the job of the passer to put it there hard enough toforce the teammate to recoil it into a proper puck protecting stance or future passing position. If a pass gets to the target to soft it will die on the wrong side of the players body and handcuff them for their next move. 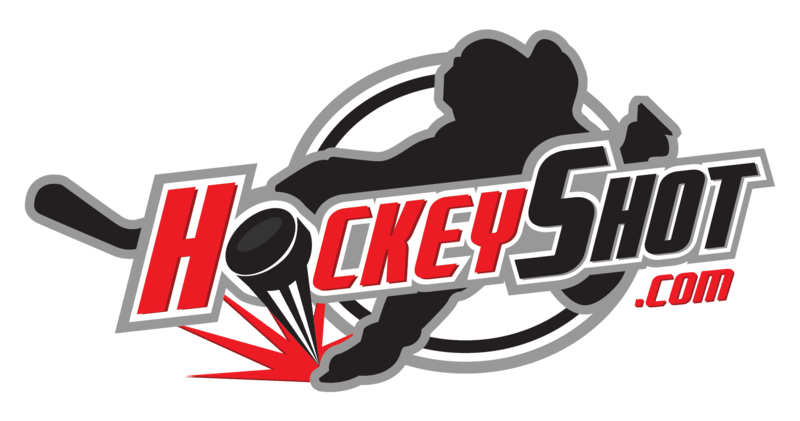 Start he puck on the toe– One of the main requirements to a good hard pass is maximizing the amount of contact between the stick blade and the puck as it is released. Starting the puck on the toe of your stick not only limits this, but also makes the passing trajectory almost impossible to predict. The greatest amount of power translating from your arms and down the shaft of the stick arrives at the heal and decreases toward the toe. The toes of the twig is for height, and the heel is for power. Always allow the puck to roll from the heel to just past the mid blade as the pass sweeps across your midline. Trade in balance for pressure on the shaft– There is no way a pass can be effective if the passers weight is equally distributed on both feet. In order for the puck to have any momentum moving toward the target, you must have momentum moving in the direction of the target. This could mean crossing over or skating to get your body out in front of the puck, or obviously pull the puck back to wind up. The first choice means you are actively engaging in the direction of the puck. For the second choice, once the puck is pulled back, it doesn’t assure that you will move toward the target. You must accelerate in the passing direction as you release the pass. The results are the same, but the first option (getting your body out in front of the puck first) means you are providing the puck with momentum, where the second option (pulling the puck back) means that you must be in tune with the pass strength so that it can give you momentum. 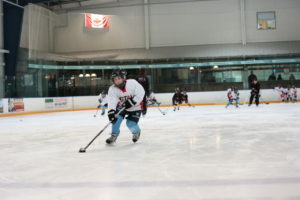 Slap at the puck– Usually, if you watch a beginner pass the puck, they tend to swing their stick toward a gliding or stationary puck and slap at it. Also known as a grenade, this type of pass has no precise destination. A passer can get in the general direction of a teammate, but timing and accuracy suffer. The puck must be making contact with the stick blade throughout the whole passing motion in order to maximize time on stick and force transfer. Glide before passing– When it comes to passing, body language is everything. In a sport that depends on explosiveness and speed, any sort of glide or slowing down alerts everyone in the rink that something is about to happen; a shot, a pass… some sort of decision to change the current plan of action. Not only does it serve as a valuable cue to the opposition to prepare, more importantly… gliding kills momentum. The minute you glide, you pull the rug out from underneath your chance of moving the puck with any sort of authority. Gliding before passing makes you more predictable as the other team reads and picks off your pass.